JAPAN CDs shop - Mini LP CDs (paper sleeve), Rare JAPAN CDs with OBI, 60s-70s ROCK, BLUES, R&B、JAZZ - Ship to WORLDWIDE from Japan! Newsletter of NEW ARRIVALS and PRE-RELEASE. Sent once 2 weeks. If you join, input your e-mail address. 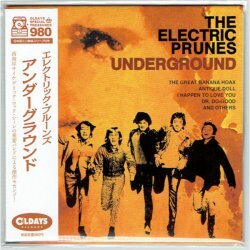 Second album of Electric Prunes. Japanese mini LP CD with OBI. This is UNOPENED, BRAND NEW ITEM. ⇒ Released as Japan edition CD, but disc is pressed in Taiwan. Mini LP CD with OBI. When you have any questions, please feel free to contact us. ⇒ Other Mini LP CDs of OLDAYS RECORDS are here. All our CDs are authentic item. If you have any questions about this item, please feel free to ask us. "S / Unopened" is Sealed or Unopened. "NM / Near Mint" is No Damaged and Very Clean condition. "A / Excellent" is Very Minor marks of Used, etc. "AB / Very Good" is Minor Used/Wear, etc. "B / Good" is Damaged Lightly or Some Scuffs/Scratches etc. "BC / Acceptable" is Damaged or Major Scratches etc. "C / Poor" is Damaged Badly etc. Our Selling Price is Not include Import Tax. Item will be shipped from JAPAN. We ship to Worldwide through Japan Post Service. Wrapped in plastic bubble wrap and packed in Cardboard Box very carefully. You can choose following Shipping Method. ⇒ takes approximately 1-2 weeks (+ Customs handling time) to arrive. ⇒ takes approximately 3-7 days (+ Customs handling time) to arrive. Please choose Registered Airmail or EMS. You can track the package at Japan Post Office website. "Airmail (No Insurance)" has no Tracking Number. so we can not have responsibility on arrival. Copyright (C) BEAT-NET RECORDS. All Rights Reserved.